Anorexia nervosa (AN) is a complex neuropsychiatric disorder presenting with dangerously low body weight, and a deep and persistent fear of gaining weight. To date, only one genome-wide significant locus associated with AN has been identified. We performed an exome-chip based genome-wide association studies (GWAS) in 2158 cases from nine populations of European origin and 15 485 ancestrally matched controls. Unlike previous studies, this GWAS also probed association in low-frequency and rare variants. Sixteen independent variants were taken forward for in silico and de novo replication (11 common and 5 rare). No findings reached genome-wide significance. Two notable common variants were identified: rs10791286, an intronic variant in OPCML (P=9.89 × 10 -6), and rs7700147, an intergenic variant (P=2.93 × 10 -5). 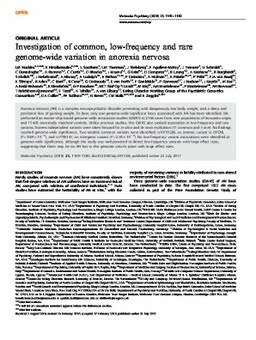 No low-frequency variant associations were identified at genome-wide significance, although the study was well-powered to detect low-frequency variants with large effect sizes, suggesting that there may be no AN loci in this genomic search space with large effect sizes.